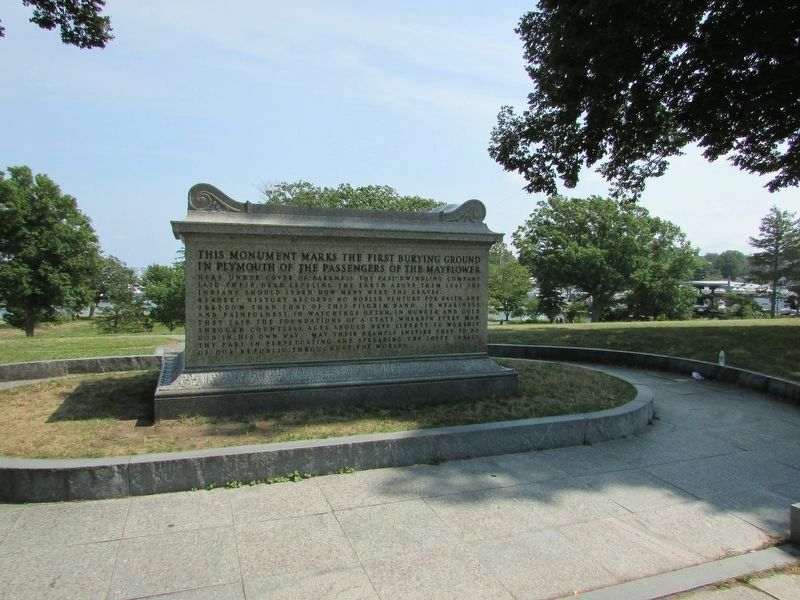 Pilgrim Memorial State Park is designed around Plymouth Rock, a large glacial boulder deposited in the harbor and smoothed by centuries of tidal wash. The rock is not only a landmark, but also a symbol of the courage and faith of the men and women who founded the first New England colony. 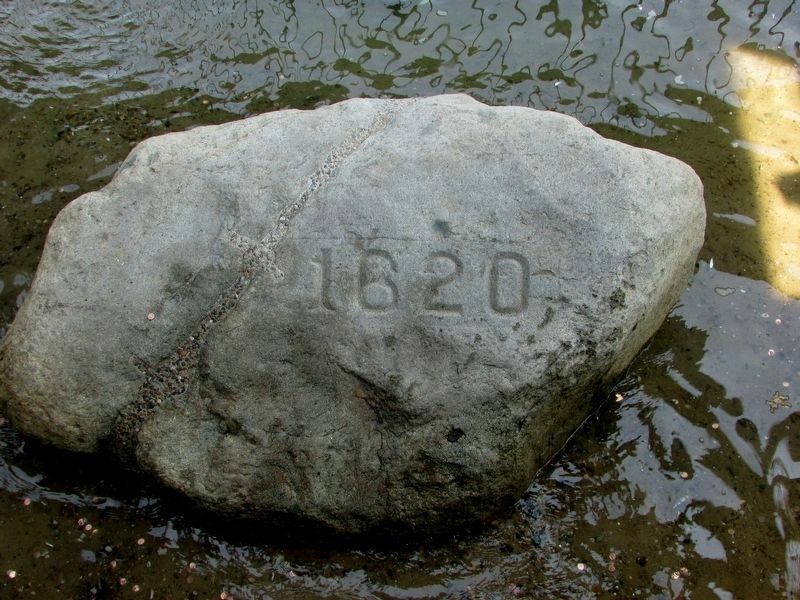 Tradition tells us that the Pilgrims first stepped here when they arrived in December of 1620, on land long inhabited by Wampanoag (or Pokanoket) Native Americans whose sachem, Massasoit, befriended the Pilgrims. Without the help of the Wampanoag, the Pilgrims would likely have starved soon after their arrival. 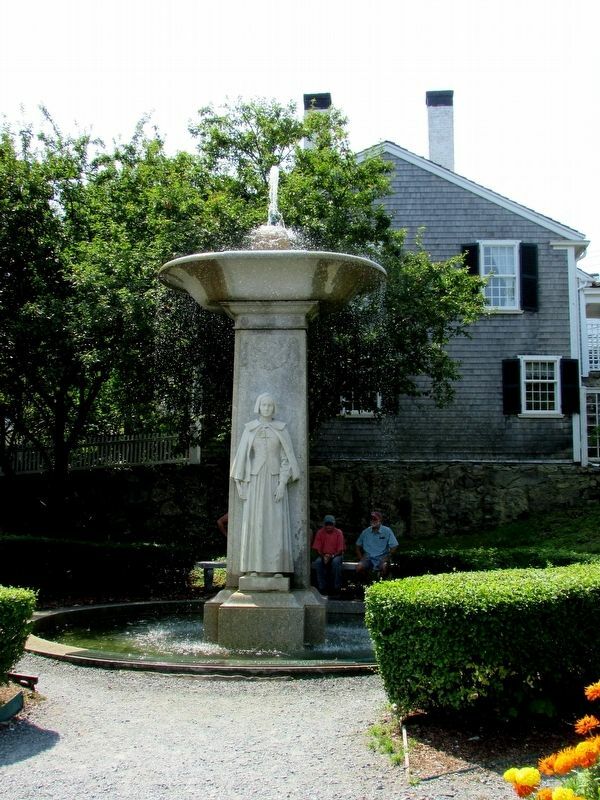 • Visit Plymouth Rock where you can learn the interesting history of the Rock and its famous portico. where a sarcophagus is the final resting place of many early Pilgrims and where a number of organizations have memorialized their connections to the Pilgrims. 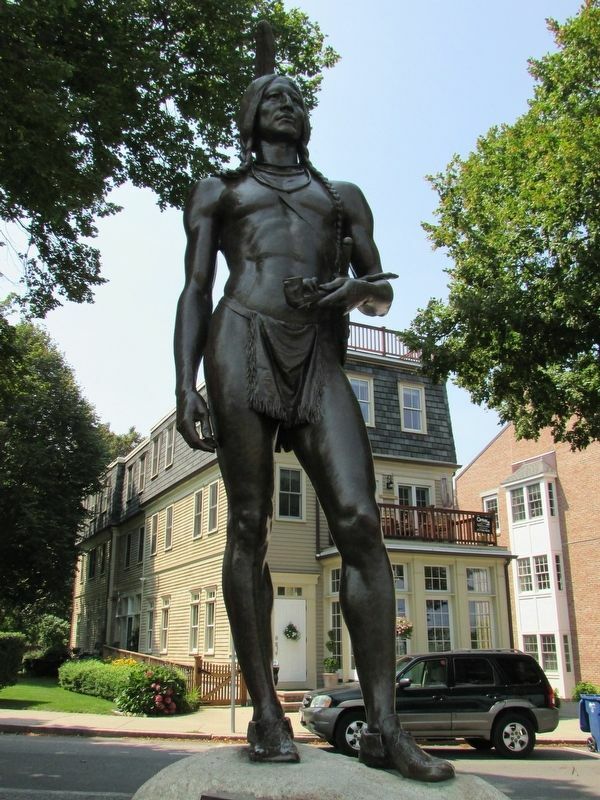 • Tour the works of art dedicated to historical events and figures in Plymouth’s history – the Massasoit statue on Cole’s Hill, the William Bradford statue on Water Street near the portico, and the Pilgrim Mother fountain across Water Street. • Take a stroll on the Frazier State Pier. • Enjoy a picnic or cultural program in the grassy south end of the park. Location. 41° 57.566′ N, 70° 39.76′ W. Marker is in Plymouth, Massachusetts, in Plymouth County. Marker is on Water Street, on the right when traveling north. Touch for map. Marker is in this post office area: Plymouth MA 02360, United States of America. Touch for directions. 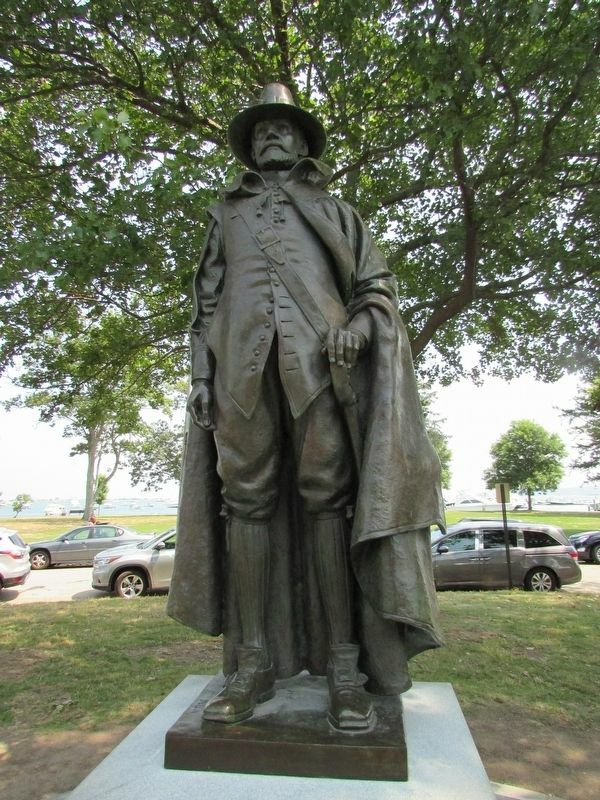 (about 500 feet away); James Cole (about 600 feet away); Plymouth Rock (about 600 feet away); National Day of Mourning (about 600 feet away); First Burying Ground of Mayflower Passengers (about 800 feet away). Touch for a list and map of all markers in Plymouth. More about this marker. 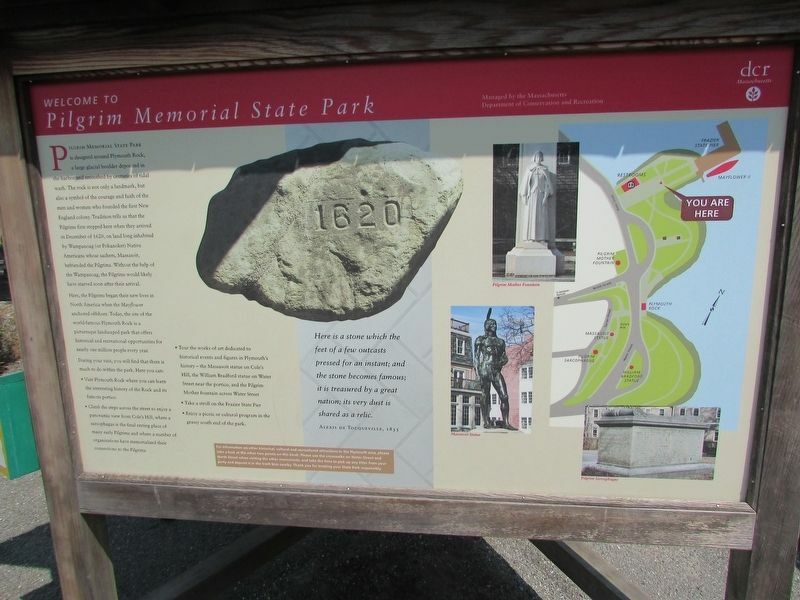 The right side of the marker contains a map of Pilgrim Memorial State Park that indicates the location of the marker and the historic sites of interest mentioned on the marker. 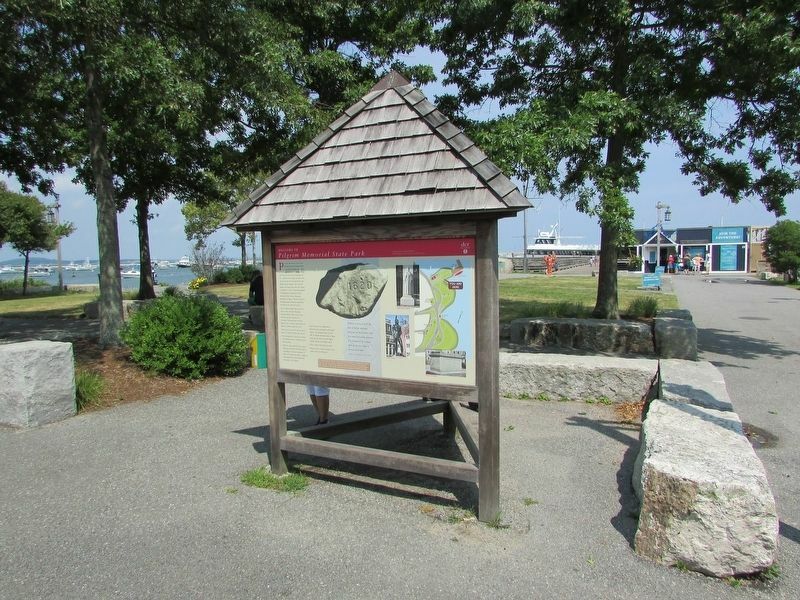 Also on the marker are photos of Plymouth Rock, the Pilgrim Mother Fountain, Massasoit Statue and the Pilgrim Sarcophagus. More. Search the internet for Welcome to Pilgrim Memorial State Park. Credits. This page was last revised on August 27, 2017. This page originally submitted on August 27, 2017, by Bill Coughlin of North Arlington, New Jersey. This page has been viewed 110 times since then and 11 times this year. Photos: 1, 2, 3, 4, 5, 6, 7. submitted on August 27, 2017, by Bill Coughlin of North Arlington, New Jersey.